The main disadvantage of the low pressure sodium lamp is its poor colour rendering property, producing a monochromatic yellow light. This characteristics limits its application to outdoor uses. However, if the temperature is increased inside the lamp and therefore the pressure, a much improved colour of warm golden-white is produced. This improved property was made possible by having the inner arc tube made of translucent ceramic material using alumina which is capable of operational at temperatures up to 1500 °C and withstanding hot sodium vapour (Figure 1). The inner arc tube contains sodium and a small amount of mercury and argon or xenon. The outer glass envelope enables the inner arc tube to be maintained at a temperature of not less than 750 °C. The initial discharge in the argon (or xenon) gas is start by a high voltage pulse of between 2 KV and 4.5 KV. Heat is generated which causes the sodium discharge to commence. 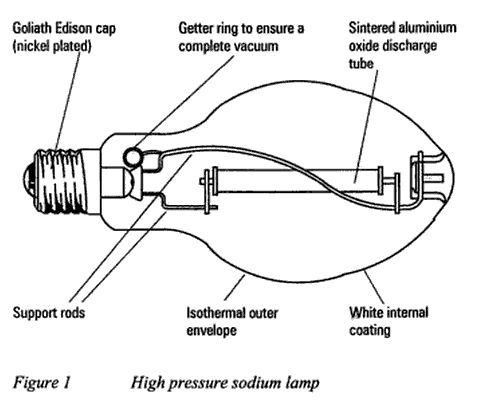 The addition of mercury causes a higher lamp impedance and an increase in discharge arc voltage between 150 V and 200 V. Maximum sodium vaporization takes about six minutes, resulting in pleasant golden-white light. 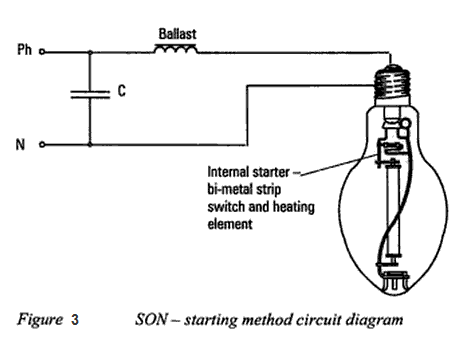 Two methods of starting the lamp are shown in figures 2 and 3. 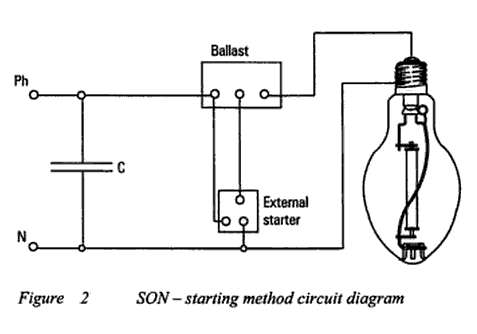 Power factor correction capacitors are required in each circuit and starting methods may be internal or external to the lamp.